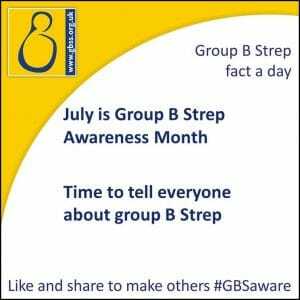 July is Group B Streptococcus Awareness Month, organised by leading charity Group B Strep Support. This blog considers the implications of Group B Strep infection and why increased awareness is so important, particularly amongst pregnant women. Group B streptococcus (also known as GBS or strep B) is a bacteria which colonises between 25 and 30% of adults in the UK. In the vast majority of cases there are no symptoms or side effects. However, GBS can occasionally cause infection. Whilst GBS can be carried by many pregnant women without incident, if a newborn baby acquires a GBS infection then the effects can be very catastrophic. Group B Strep is reported to be the most common cause of life threatening infection in newborn babies and is the leading cause of meningitis in babies under 3 months old. One baby a week dies from GBS infection and one baby a fortnight is left with long term disabilities as a result of acquiring the infection. Fortunately, if it is known that the pregnant woman is a carrier of GBS then prophylactic antibiotics can be commenced to prevent the newborn becoming infected. Unfortunately, current UK policy does not provide universal screening and instead is based on a ‘risk factor’ approach. Group B Strep Support (GBSS), the leading charity which strives to prevent life threatening GBS infection in newborn babies, campaign vehemently for universal screening to be offered in the UK, as is the case in many other developed countries. Why guess when you can test? Group B Strep Support set up the Why guess when you can test? campaign to increase awareness of GBS and the potential implications. GBSS advocate the use of ECM testing to identify whether a pregnant women is carrying GBS bacteria. If the test is positive then clinicians can be made aware and the pregnant woman ought to receive prophylactic antibiotics during labour to protect their unborn baby from contracting the infection. The test is very easy to perform and very reliable. It costs only around £30. Unfortunately this is not available for pregnant women on the NHS, unless they are deemed to be at a higher risk of being colonised for GBS infection. The current system means that many women who carry GBS bacteria do not realise it, having devastating repercussions in some cases. As part of GBS Awareness Month the charity are hoping to make more women aware of GBS infections and of the simple testing procedure which can be performed to confirm whether or not GBS is being carried. There is a wealth of information available on the charity’s website and a number of ways that you can help their campaign such as, by raising awareness, fundraising or by signing the Government petition to seek a change to the current healthcare policy in this area. It is incredibly frustrating to know that a simple and harmless test could prevent a number of babies dying or being left with catastrophic injuries and so I would encourage everyone to support the work of GBSS and to spread the word so that pregnant women are fully informed of the options available to them. A case study of a young child who contracted GBS infection as a result of failings during his mother’s labour.